ReadyB Is a NEW platform that provide immediate services for more than 4000 different categories. Anyone can ask for service OR provide service. After anyone register (as a service provider for example) … he/she will need to select what categories of services you would like to give (Carpet Cleaning, Nanny, Handyman and many more categories of services) and how far they are willing to drive for any job. Each time they are ready to work… all they need to do is to CHECK IN, and when they don’t want to work… just CHECK OUT. - Select the location of the requested service. - Select the category of the service they need. - Provide a description, photos or video (any of them). The app will show them a list of who is available for that work. After he/she selected whoever they want to hire.... the app will send that service provider a notification about the new service request that just came in. After that service provider review the information about the requested service (Video, Images, Description) they will need to submit their price for that service. If the consumer approved the price… than they will go/drive to the service location. At the end of the service they will have the consumer sign on the service completion screen. 2 days after – the money will be in your bank account. The main key about ReadyB is that anyone can hire someone in LESS than 5 MINUTES. VERY simple to use and totally FREE. 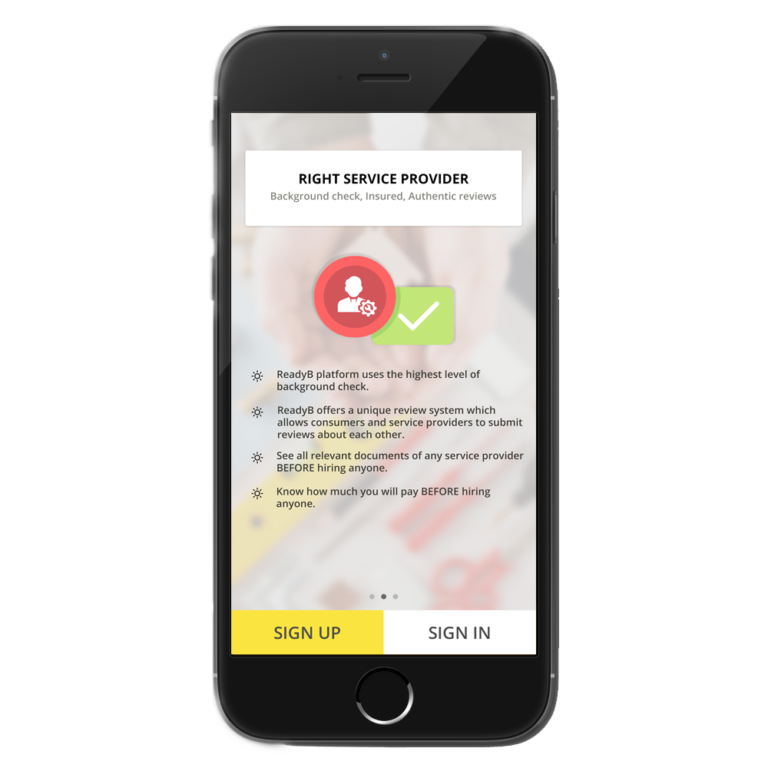 The ReadyB application have many service categories such as: Handyman, painters, electricians, notary, cleaning, ironing, torturing, security, dancing teachers and many many more…. (more than 4000).